I don't really like apples that are not crunchy and fresh. At some point in their life (when they get older), they become too soft. 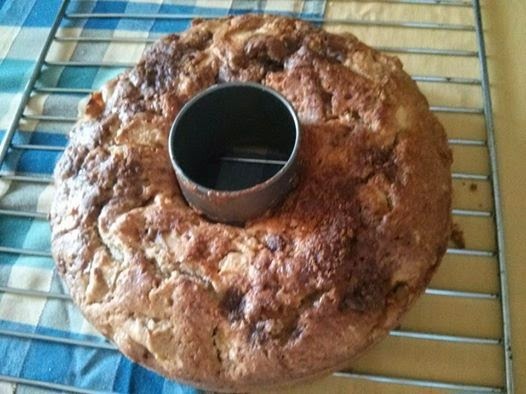 Since I had quite some that had reached that stage, I decided to make this Irish apple cake. During the whole preparation I was praying the little queen wouldn't wake up, since in that case it would be impossible to finish! The recipe is here (and images that are much better than mine, too!). When making this cake, I don't make the accompanying custard sauce, since I make cakes for breakfast, and who has time in the morning for fresh custard? I find this cake delicious on its own. After cutting the apples, I poured some Calvados on them. It adds a nice flavour to the final result. I substituted cinnamon for cloves and nutmeg. I love cinnamon, and I think it's perfect with apples. I quite dislike nutmeg, so this was an easy choice. Instead of white sugar, I sprinkled brown sugar on top, thinking it'd give the cake more flavour. I don't know if it was a good idea though, since white sugar melts better in the oven and forms a nice crust, that the brown sugar didn't make. Now I just have to wait for it to cool down enough to try it!